Happy Holidays, dearest listeners! I know you’ve opted for nice over naughty this year, so episode 71 is just for you – especially if you love cranking the kaiju tunes. I haven’t done an all-music episode since the very first December show, and since my plans for this December show sort of fell through, I figured it would be a great time to do it all again. We’ll be back after Christmas with our regularly scheduled programming and the Daikaiju Discussion for Frankenstein Conquers The World. In the meantime…Merry Christmas! There won’t be any interviews, discussions, news or local events in this episode. In fact, I only pop in twice to talk for a couple of minutes each time. All in all, I am actually very happy with the music that I played – most of which has never been played on the show and I think we have a pretty strong representation of kaiju composers in this list – not everyone, but a lot. 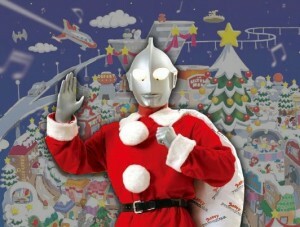 I even threw in the Ultraseven theme (btw – go buy that DVD set that just came out!). Don’t forget that this month’s Daikaiju Discussion homework is due in just a few days! Please watch the 1965 Toho classic, Frankenstein Conquers The World and send your thoughts, questions and reviews to controller [at] kaijucast dot com before December 23rd to get your submission into the next episode!